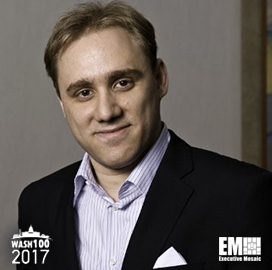 Executive Mosaic is honored to introduce Dmitri Alperovitch, co-founder and chief technology officer of California-based cybersecurity firm CrowdStrike, as an inductee into the 2017 edition of the Wash100 — Executive Mosaic’s annual selection of influential leaders in the government contracting arena. Alperovitch is a 10-year information security veteran who oversees CrowdStrike’s intelligence and technology teams. In a blog post published in December, he reported how the CrowdStrike team detected the re-emergence in November of Shamoon, a destructive wiper or malware that was originally introduced by Iranian threat actors on several energy firms in the Middle East in 2012. Alperovitch and his CrowdStrike team also helped discover a data breach on the Democratic National Committee’s networks and linked that cyber attack to Russia, according to an October 2016 article by Vicky Ward for Esquire magazine. Alperovitch co-founded CrowdStrike in 2012 with George Kurtz, who currently serves as the company’s president and CEO. “We saw that no one’s really focused on the adversary,” he told Ward of the reason behind the establishment of CrowdStrike. Alperovitch previously served as vice president of threat research at McAfee, which now operates under Intel’s security business. He is president of Asymmetric Cyber Operations, a senior fellow of the Atlantic Council and an advisory board member of the RSA Conference. Alperovitch is a former member of the Center for Strategic and International Studies’ cyber policy task force and a former advisory board member of Georgia Tech Information Security Center. He has developed and patented 18 technology platforms in the field of data security and has performed research on web security, malware detection, identity-based cryptography, spam detection and reputation systems. He is also a recipient of the MIT Technology Review’s 2013 Young Innovators under 35 award and has a master’s degree in information security from Georgia Tech. Executive Mosaic congratulates Dmitri Alperovitch and the CrowdStrike team for their selection to receive this award.